Heidi Berrin Shonkoff has always engaged in what she calls the private pleasures of a creative life. From a very early age she recalls the sensuousness of immersing herself in art and art materials—collecting things for collage, drawing, throwing pots, loving the feel of paint, the ooze of clay, the smell and colors of crayons. Experiencing this “zone of total immersion” has continued to characterize her working process as a mature artist. Shonkoff’s late father, Stan Berrin, was a painter. She has vivid childhood memories of standing beside him as he worked, smelling the delicious aroma of his oil paints intermingling with the cherry tobacco in his pipe, and riding around to galleries on the back of his motorcycle. Shonkoff was a serious student of classical ballet and she has continued to dance throughout her life. Her paintings are marked by a sense of movement and kinesthetic vibrancy directly influenced by her background in dance. 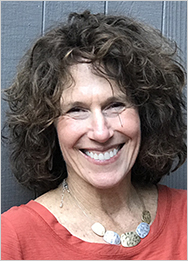 Shonkoff completed her undergraduate and graduate studies at the University of California, Berkeley and has been a practicing psychotherapist since 1983. Working so intimately with people in her clinical practice has strongly influenced the depth and texture in her art. Shonkoff took classes in black and white photography and darkroom technique from 1979 to 1981, but her formal study of painting began in 1997 when she enrolled in life drawing courses at UC Berkeley. She has studied extensively with internationally exhibited painters Christine Peirano and Leigh Hyams. She cites both of these artists as major influences on her work. Shonkoff has been married for many years and has two grown sons. She lives in Berkeley, California.